When it comes to getting a daily coffee fix, the West Coast is king, with three Bay Area cities counting among the top 10 American cities for java junkies. 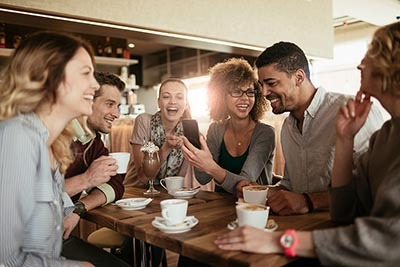 That’s according to a study by SmartAsset, which ranked the best 25 U.S. cities for coffee fanatics on a scale of 100 based on criteria such as the number of coffee shops and roasters and the average price of a cappuccino. By those measures, Oakland ranks as the third best U.S. city for coffee drinkers behind Portland, Oregon and Seattle, with a score of 91.40. Oakland has a total of 623 coffee shops, 22 of which have exceptional Yelp reviews. San Francisco takes the No 6. position with a score of 85.95. San Francisco’s 2,427 coffee houses translates to 279 shops for every 100,000 residents, the highest such concentration of any city included in the study. San Jose follows its neighbor to the north in the No. 7 spot, notching a score of 85.12. SmartAsset notes that San Jose residents perform a large number of Google searches for the word “coffee” when trying to decide which one of the city’s 940 cafes to hit next. While properly pricing a home is key to a successful sale and a huge advantage to working with a skilled real estate professional, there may be times when the right price is a higher one. A realtor.com article offers some advice for when sellers should up the price tag on their homes, starting by studying data. If market conditions have changed significantly since a home was placed on the market, it might be prudent to consider raising its price, particularly if inventory conditions are tight (as they are currently). Also, think about whether your home has amenities that other nearby for-sale properties lack, such as a swimming pool. Other instances in which a price hike might be warranted: if a home has been renovated since being listed, if an appraisal value comes back higher than the list price, or simply to reinvigorate buyer interest. Amassing a down payment is perhaps the largest obstacle that first-time homebuyers face, and a new program seeks to ease that burden by making financial help a company benefit. According to a CMG Financial press release, a new HomeFundMe program called Affinity Portal allows businesses to match employee contributions to their personal down payment savings, much like a 401(k) plan. The program is specifically geared toward millennials, whose hurdles to homeownership including student loans, high home prices, and escalating rental costs. The program also aims to help employers retain talented younger workers, 78 percent of whom leave a company within five years. Much has been written about the recently enacted tax-reform package, and it was clearly on the minds of U.S. consumers as 2017 ended. Fannie Mae’s latest Home Purchase Sentiment Index declined to 85.8 in December, down form November but up on an annual basis. The number of Americans who think it is a good time to buy a home dropped from the previous month to 24 percent. And though more than two-thirds of workers are not worried about losing their jobs, that number also declined from November.